On January 7, 2006, Payton Lynn was born, weighing 7 pounds 1.5 ounces and measuring 19 3/4 inches long. She was a beautiful baby with a head full of hair, just like her big brother! 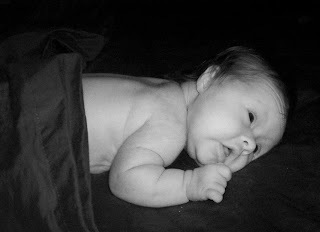 Soon after her birth, our angel was diagnosed with Down syndrome. Immediately after delivery, Payton was whisked away to the Neonatal Intensive Care Unit (NICU) for breathing problems. Once the doctors' suspicions arose that she may have Down syndrome, they did blood work and called in a cardiologist, since many babies with Down syndrome have heart problems. Her red blood cell count was high, as is fairly normal in Down syndrome babies, and we learned that she had a PDA, a small VSD, and her heart pressures were off. This, believe it or not, was great news, as her heart problems could have been much worse. The PDA is a blood vessel that is open in utero, but is supposed to close at birth...well Payton's did not close. The VSD is a hole in between her ventricles. We were told that this hole is tiny...pin-point size. Due to her pressures being off, the blood was shunting back and forth through these two openings, causing her to have to work harder to breathe. So, she was put on 100% oxygen assistance until the PDA closed...which it did, thankfully, after a couple days. Her heart pressures were getting better and eventually the blood quit shunting through the VSD, so we were able to wean her off of the oxygen. By day four, she was completely weaned and was doing great. We have been told that her VSD should close on its own with time, given how small it is. The next step was getting her to increase her feedings and make sure she could hold her body temperature. She did fabulous in these two categories and was able to go home when she was seven days old. We were thrilled! Payton was sent home on a 30-day dose of antibiotics, as her kidneys were also slightly dilated. The doctors did not seem too concerned with this, as they claim they see it often enough and that the dilation should go down. Well, we'll see. We will have another ultrasound on her kidneys to see if they are better. Since coming home, Payton has adjusted great...we have all adjusted great. Mason adores his little sister and can't get enough of her. While we were initially heartbroken over our angel's diagnosis, we quickly came to embrace it. Sure, we cried our fair share of tears, but time heals the pain. We don't look at her and see a big DS on her forehead. Payton is just a baby, our precious little girl. She is no different than any other baby...all except for that fluke with her chromosomes. That does not change the amount of love that she needs from us, nor the amount of love and joy she gives us, and we hope that everyone else sees that too.